Google's retail packaging is clean and its colorful elements are inviting. Of course, the quad-color "G" is on the front, along with a graphic of the phone. The right side of the box has a side view of the phone printed to scale. The back/bottom of the box reads: "#teampixel" against a blue background. Finally, the left side of the box is dedicated to: "Google Assistant built-in" with a Google Lens camera icon. Sliding up the top part of the box reveals the phone, wrapped in translucent plastic. Under the phone's cardboard insert is a welcome pack with documentation including quick-start guide, SIM-eject tool, and reference booklet. Under the documentation is an OTG to USB-A adapter, which Google calls its "Quick Switch" adapter. With it, you can physically plug your old device into the new Pixel and transfer your content directly. Under the Quick Switch adapter is a USB-C to 3.5mm headphone jack adapter, as well as a USB-C to USB-C cable for charging the Pixel 2 XL. There is also a USB Power Delivery 2.0 adapter with a USB-C port, so no USB-A cables allowed here, unless it's to connect to a PC. The Pixel 2 XL's design is refined from the Pixel XL from last year. This time around, the 2 XL's design is simpler, yet somehow more attractive. The exterior is made up of three major parts: the front glass, the back cover and the rear glass window. A single piece of metal makes up the frame of the phone before curving toward the back panel. This metal is covered in Google's "Premium Hybrid Coating". The new design also omits the use of antenna lines. This means that transmitting components were placed either behind the rear glass window or around the display, which is made of "3D" glass. The glass is tapered all the way around the display, which raises it past the frame. This subtle design choice makes for a more attractive design. We got a Just Black model from Google, which holds a different textural finish from the Clearly White or Kinda Blue Pixel 2 models. The black paint finish is a bit "grittier" than the other paint jobs and offer a really nice feel in your hand along with improved grip. The lack of a glossy finish also means you'll see much less smudging, but the glass window in the back is still glass. Even so, you'll want to put this guy in a case, as the front glass protrudes past the frame. This means you should never put the Pixel 2 XL flat on its face without a case to lift the glass away from the surface. Whichever color option you go for will offer the same black bezels in the front. This includes the Pixel 2 XL's Black & White option with a white back and a black glass window, as well as the Pixel 2's Kinda Blue color option. We're glad that Google went this route, as the sight of white bezels against a black display panel has run out of style. There's a 6-inch P-OLED display on the front - complete with an 18:9 aspect ratio and rounded corners. This pins the Google Pixel 2 XL up against the other smartphones with taller displays that were released this year, as this is the direction that smartphone makers have been moving towards. Above and below the display are front-firing stereo speakers. The one above the display also doubles as the in-call speaker. To the left of the upper grille is an 8MP selfie camera with f/2.4 aperture. Centered under the speaker grille are the light and proximity sensors with an RGB LED for notifications to the right of it. On the bottom is solely a USB-C port. There's not even a mic hole, so it must be combined with the loudspeaker in the lower speaker grille. On the top edge is only a noise cancelling mic. Google removed the headphone jack on the Pixel 2 XL, but you can find an adapter included in the box. On the left side is the nanoSIM card tray while the right side is home to the physical buttons. Toward the top of the right edge is the power key, and the volume rocker sits underneath it. Honestly, we wish the power button was closer to the center of the phone, maybe it should have traded places with the volume rocker. In our time with the Google Pixel 2 review units on both sides of the Atlantic, we pushed the volume rocker instead of the power button way too many times to call this sensible positioning. On the back is the camera system, which takes up the left side of the glass window. This consists of the Camera ring (which does protrude as a result of the added OIS), a dual LED flash, and just under it are a couple of autofocus assist sensors, which are harder to see on the black model. This camera ring sort of reminds us of the LG-made Nexus 5. Below the window is a rear-mounted fingerprint scanner and way below it is a glossy "G" to indicate it's Google's product. In fact, unlike the iPhone, there's no "Pixel" branding on it, keeping the branding and labeling to a bare minimum. Next up, we'll be looking at the Pixel 2 XL next to the smaller Pixel 2 and the first-gen Pixel XL. The Pixel 2 is considerably smaller than the 2 XL but offers all the same features and hardware as the larger model at a lower price. Design-wise, it is synonymous with the larger Pixel 2 XL minus the 3D glass covering the display. The Just Black color options are identical between the two models while the Clearly White and Kinda Blue options are exclusive to the smaller phone. The Black & White (A.K.A. "Panda") color option is exclusive to the larger 2 XL. Perhaps the reason that we find Google's new design much nicer over the first-generation Pixel's is the way the camera ring and flash actually fill the window space up nicely. The camera ring is back now, and there is OIS too. The camera ring and LED flash next to it reminds us of the LG Nexus 5's camera arrangement. The Pixel XL's Quite Black and the 2 XL's Just Black are a bit different. While the Pixel XL had a very dark charcoal-like color with a graphite-like glass window, the Just Black Pixel 2 XL is more literally black. No hints of gray or charcoal here. 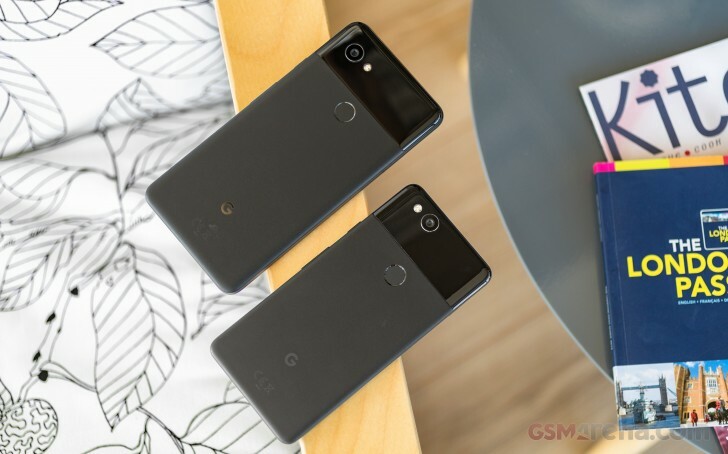 The newer XL is just slightly taller than the first-gen and just barely wider in size, so if you're considering the upgrade, the Pixel 2 XL will feel slightly larger and with more screen.